The Heaven's Light Standing Spray is a bright and brilliant tribute that offers warmth and hope. Sunny yellow gladiolus and Asiatic lilies are offset by crème de la crème roses, orange gerbera daisies, purple lisianthus, green button poms and lush greens. 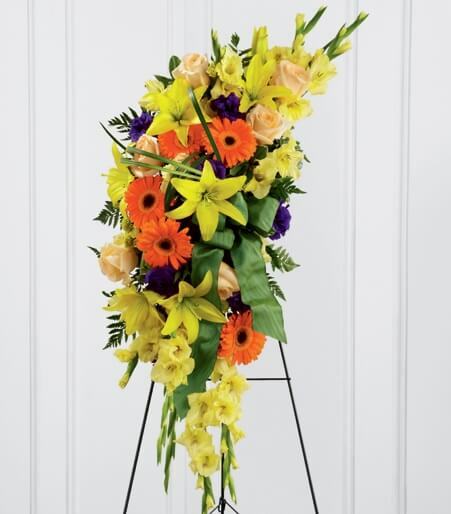 Accented with a designer sea mist green wired taffeta ribbon and displayed on a wire easel, this beautiful standing spray will be a ray of light to honor the deceased and bring comfort to friends and family.